Ms. Orlando concentrates her practice in probate, mental health, confidentiality, and health care law matters. She regularly advises hospitals, social service agencies, and individual clients regarding compliance with a wide array of laws, including the Mental Health Code, federal and state confidentiality laws, and the Probate Act. Ms. Orlando has dedicated her time to serving both the legal community and community at large. She served as Chair of the Chicago Bar Association Mental Health and Disability Law Committee, having previously served as vice-chair of the committee. She has taught a mental health law seminar for PESI, a nonprofit organization that offers continuing education to medical and mental health professionals. 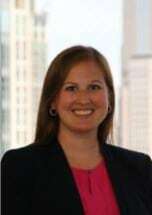 She also volunteers her time, knowledge, and skills to Chicago Volunteer Legal Services, which provides free legal service to low-income individuals in the Chicago area. Ms. Orlando received her J.D. from The John Marshall Law School, where she served as Executive Justice of the Moot Court Honors Program and President of the Disability Law Organization. She received her undergraduate degree from Illinois State University.